DUBAI, UAE: PRNewswire: Toronto’s property market continues to see strong demand, according to DAMAC International Chairman, Hussain Sajwani, following his visit to the city during a business tour of Canada this week to explore new investment opportunities. 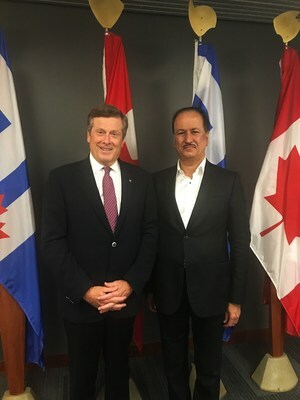 During a meeting with Toronto Mayor, John Tory, Sajwani praised Toronto’s diverse community, which continues to attract highly skilled professionals from around the world as well as international investors looking to get a foothold in Toronto’s lucrative property sector. Strong demand for condominiums and family homes in the Greater Toronto Area continues to make the city an ideal investment location. Toronto has experienced surging property prices for the last few years due to continued demand by citizens and foreigners. Canada’s federal housing agency, Canada Mortgage and Housing Corp. (CMHC), said the current stabilization in prices will be short-lived, and is an immediate market reaction to the Ontario government’s recent introduction of a 15 percent tax on foreign buyers, aimed at slowing down overheating housing prices. DAMAC continues to explore international opportunities overseas that would enable it to expand its global footprint beyond the Middle East. On 14 August 2017, it announced its first-half 2017 financial results, which showed booked sales of approximately USD 1.1 billion and deliveries of over 1,000 units at its DAMAC Hills master development, bringing the total number of units delivered there to more than 3,100. Since 2002, DAMAC has delivered more than 19,000 homes and has over 44,000 units in various stages of development. The Company’s footprint extends across the Middle East with major projects in the UAE, Saudi Arabia, Qatar, Jordan, Lebanon, the United Kingdom, and Oman. As of 30 June 2017, DAMAC Properties has delivered approximately 19,000 homes. The company has a development portfolio of over 44,000 units at various stages of progress and planning, comprising more than 13,000 hotel rooms, serviced apartments and hotel villas, which will be managed by its hospitality arm, DAMAC Hotels & Resorts. With vision and momentum, DAMAC Properties is building the next generation of Middle East luxury living.